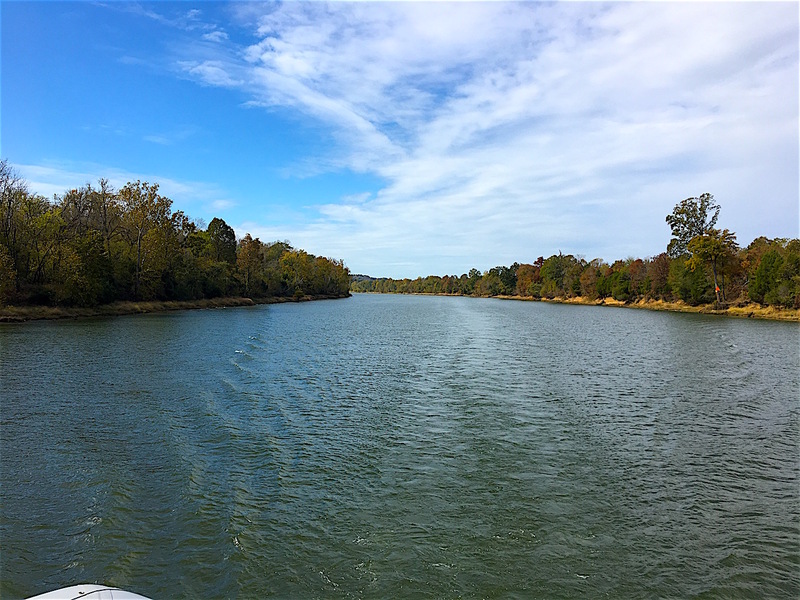 11/9 – 13/2016 Summary: While we had planned to spend just one night at Kingfisher Marina in Demopolis, AL, we were feeling like we were moving a bit too fast (not part of the plan) and behind, so we opted to spend a second night and get caught up on some things (like the blog). Kingfisher Marina was a nice marina with lots of friendly folks to visit. We met Tom and Paula (yes another Tom and Paula) Hanaway on Tango Papa, and Tom and Glenda Smitherman on Genesis plus others. We ended up traveling with those 2 boats. 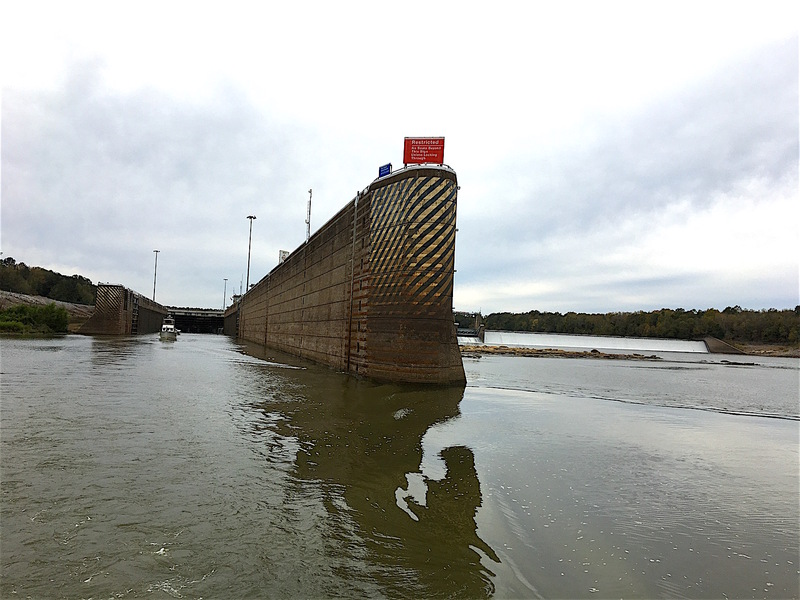 We left Kingfisher Marina early on November 9th along with 6 other boats to pass through the Demopolis Lock just a few miles downstream. Genesis and Tango Papa traveled at about the same speed as us, so we ended up at the same anchorage that evening and rafted together. (To raft together, we set our bow anchor, and because we did not want to swing out into the channel, we also set a stern anchor. Once we were set, the other 2 boats came alongside and tied to us, with all 3 boats hanging on our anchors.) After we were settled, we had appetizers on the aft deck, and then folks joined us for a potluck. Genesis ended up having to return to Demopolis the next morning due to some mechanical issues, but Tango Papa followed us downriver for the next few days. They were only a week into their Loop and we were but 250 miles from completing ours, so we sort of took on the “senior” role even though Tom H. was older than Tom V. (by a week). 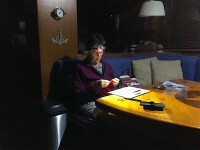 Early evenings on the hook (without daylight savings time, sunset was an early 5:00 PM) included catching up on minor projects for Tom and knitting for Paula, which produced a new pair of socks for her beloved which were nice for our cool mornings. 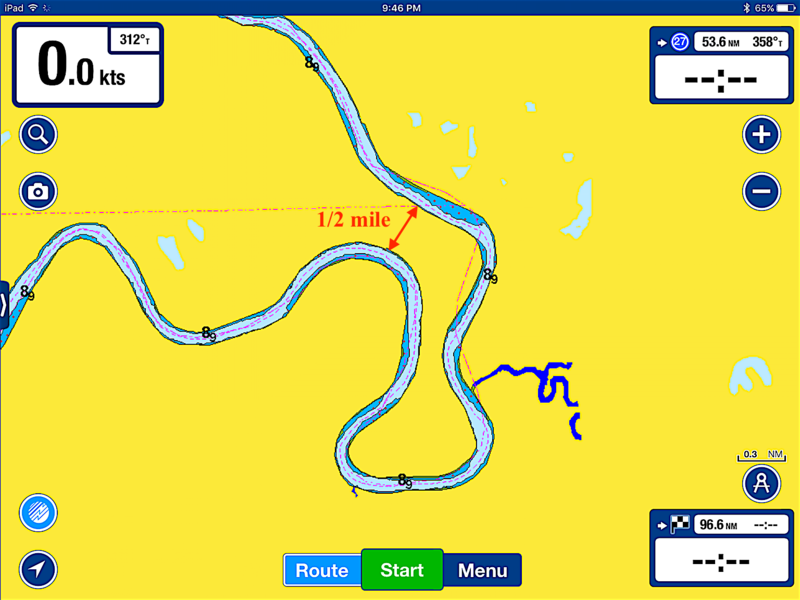 We traveled south on the Tombigbee River which became the Mobile River before it flowed into Mobile Bay where we would be crossing our wake. 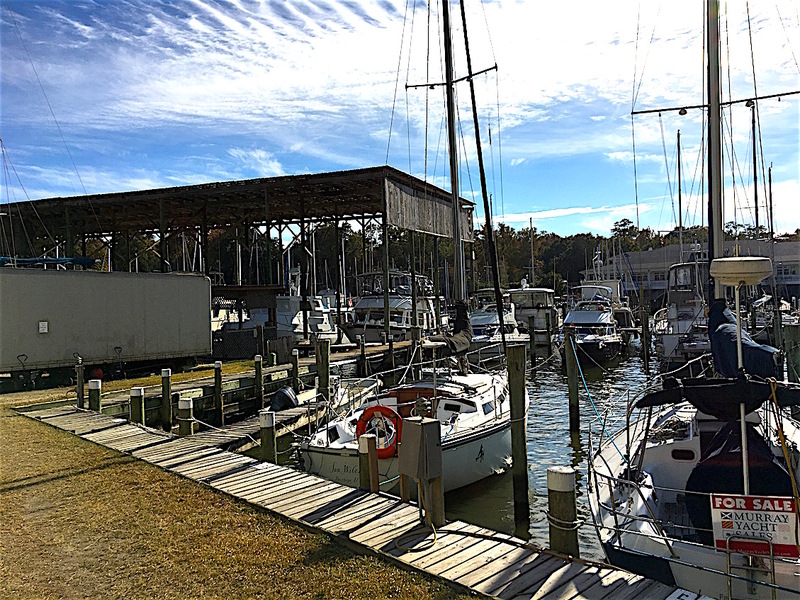 Since there was only one “marina,” (really only a gas dock) in this 250-mile stretch, we anchored out each night until we reached Eastern Shore Marina on Mobile Bay. 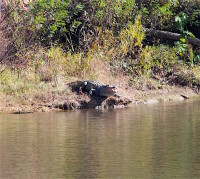 Along the way we saw eagles, osprey, gators, turtles, deer and a wide variety of human inhabitants. As we entered Mobile Bay with Tango Papa, the scene changed dramatically. As Paula said, we quickly figured out “we weren’t in Kansas anymore.” Also as we traveled, Paula was organizing a wake crossing extravaganza for the following day. This brings the summary to an end and is where, if you wish, you can read on for all the details. Or, you can go do something on your Christmas “to do” list. Thanks for stopping by. 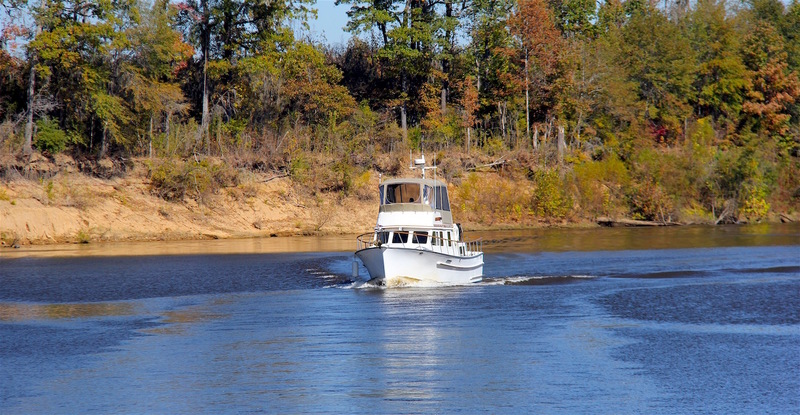 Details – We last left you at Kingfisher Marina in the Demopolis Yacht Basin on November 8. We found the marina very nice and ended up staying two nights instead of just one. 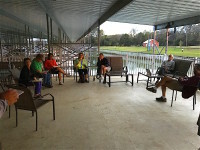 Because it was the last “real” marina for the next 250 miles, the marina attracted and welcomed Loopers and many stopped before the run to Mobile. Amenities included golf carts (the sister marina boat store was a half-mile away), a courtesy car, large lounge with 4 washers/dryers (more than most) and lovely rocking chairs, a very restful area. There was a sign-up sheet for a 5:30 bus to dinner at the Red Barn, as well as other nightly events in town during season. After doing 3 loads of laundry, Tom and Paula met (believe it or not), Tom and Paula Hanaway on Tango Papa, a 36’ Monk. Tom had actually spoken with Tom 2 days before in Columbus Marina when he watched us raise our scooter into position on the boat, but we didn’t know his wife was also Paula. Not only that, but Tom was a pilot who had built 2 kit airplanes. Guess we had a lot in common. 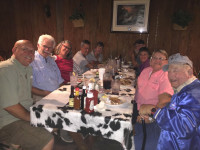 They were only 7 days into their Great Loop, having bought their boat at Green Turtle Bay in KY. We also met Rowland and Alex Harrison, a Canadian couple on Tosca II. 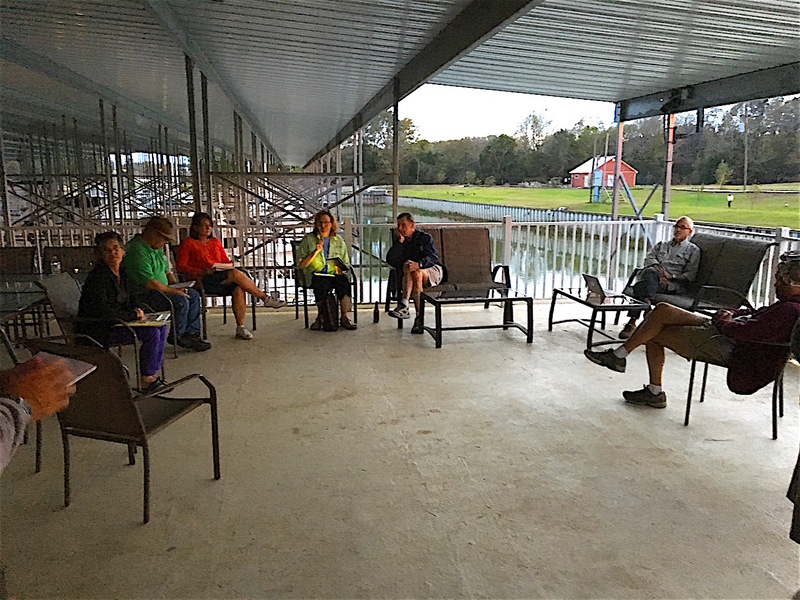 Every day at 4:30 PM, boaters who were leaving the next day gathered on the patio above the marina office to discuss plans for getting through the Demopolis Lock 3 miles below the marina. It was decided Tom would call the lock at 6:00 the next morning to see if the lockmaster would let us through about 7:00. After the meeting, a busload of people gathered and we had a very enjoyable dinner at the Red Barn with the crews from My Inspiration, Tango Papa, (both just week old Loopers) and one other non-Looper boat. It was a wonderful and reasonably priced restaurant with choices from seafood to steaks and leftovers galore. Tom got a great meal – Shrimp and Cheese Boat (mixed with rice). Paula was ecstatic to find watermelon pickles on the salad bar (a first since NC) and our waitress even got her a little cupful to take home! Back at the boat, we decided to stay another day to catch up on some chores, both ministry and boat, and having been without Internet for several days, to catch up and post another blog. (If you’ve been following us very long or maybe write your own blog, you realize this blogging takes a lot of time. But, it is enjoyable for us, and we hope you enjoy them too.) 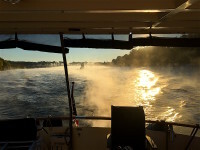 Tom still got up and made the 6:00 AM call to the lockmaster, then relayed the message to the other boats that there was an upbound barge coming and to call the lockmaster back at 8:00. The next day was consumed with chores too numerous and boring to mention. 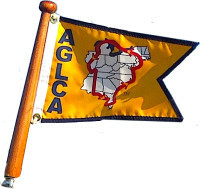 But at 4:30, we again went to the lock planning meeting and learned quite a bit more than the day before, as 2 local boaters were there who actually knew what was around the bends to Mobile. 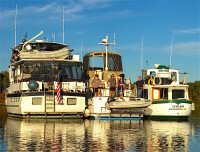 By the time the evening was over, there were a total of 7 boats eager to leave the next morning at daybreak (6:00 AM). 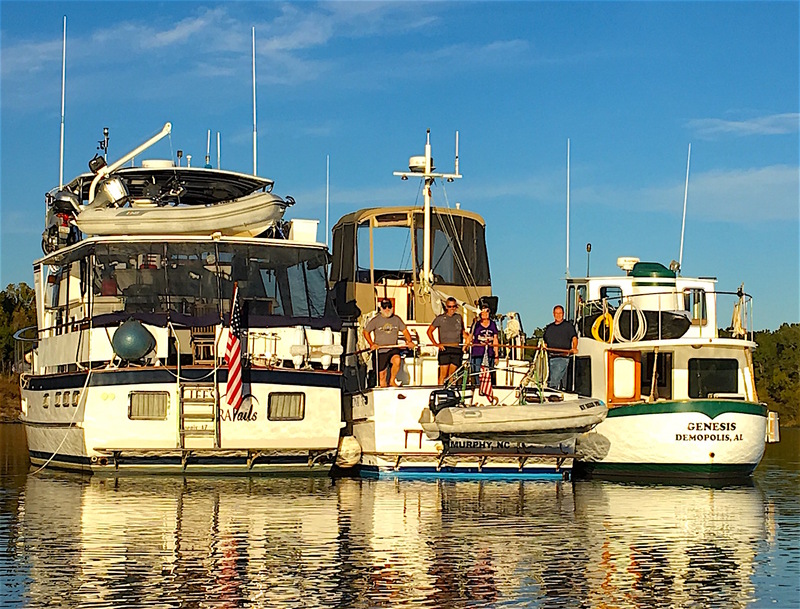 At the meeting, we met Tom and Glenda Smitherman (there sure were a lot of Toms at this marina) on Genesis, a 1969 Willard aft pilothouse trawler. They were not Loopers but lived in the area and were headed to FL for Thanksgiving. We visited their boat and learned their boat was named for Genesis 1:1 “In the beginning, God…” We enjoyed our visit and told them about Canyon Ministries. They were familiar with Answers in Genesis and had been to the museum but had not made it to the newly opened Ark Encounter yet. 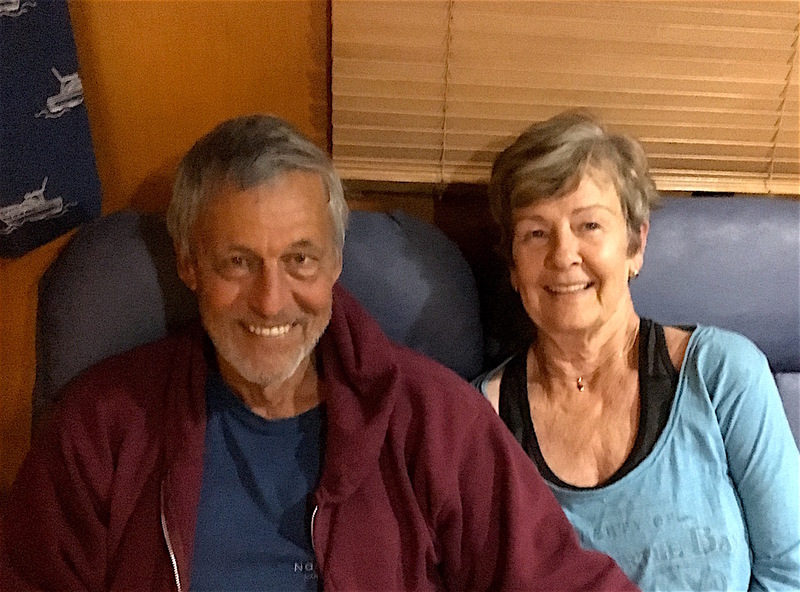 We then visited a bit more with Tom and Paula Hanaway and decided to anchor together the next night. 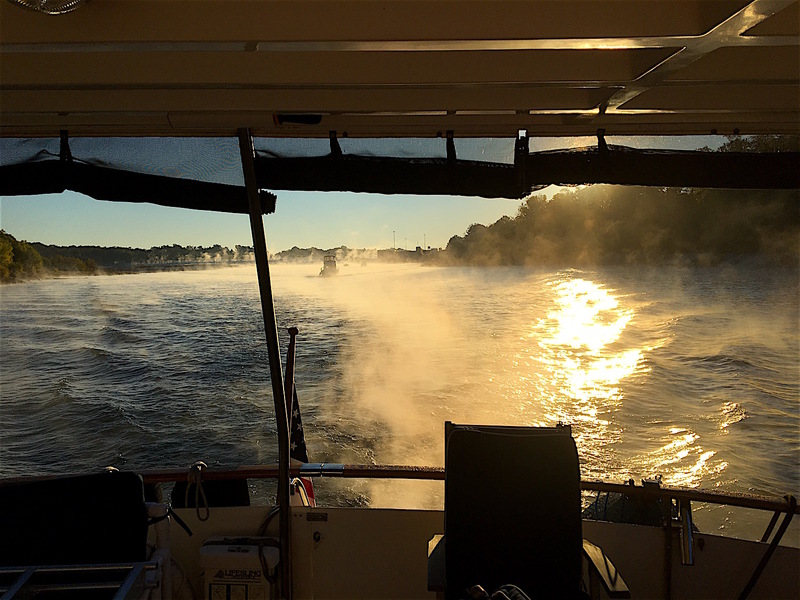 At 5:30 AM Thursday, Tom called the lockmaster to see about locking through at 6:30. There was no known traffic and he said to bring our group on down. At 6:00, 7 boats pulled out of the marina in a line and got through the lock with no wait. The reason for the daybreak departure was because of the long day – about 70 miles. 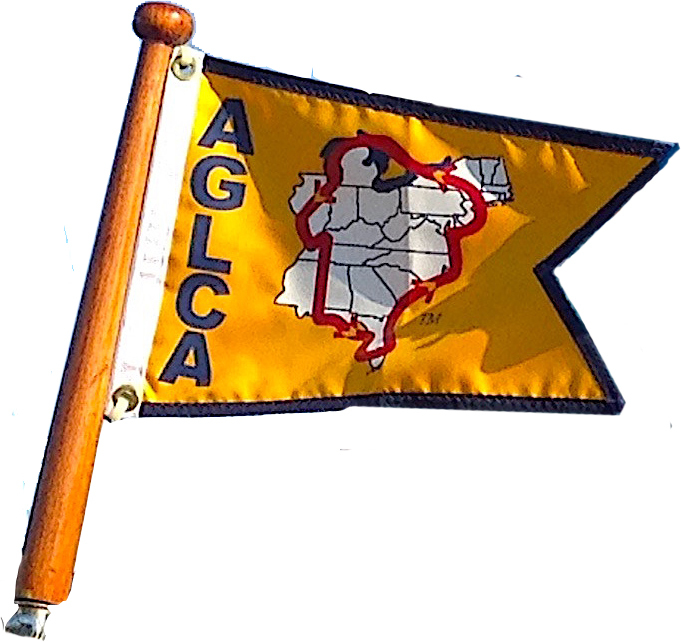 With no more marinas until Mobile Bay, for 250 river miles south, and limited anchorages along the river, overnights had to be chosen wisely and coordinated with other boaters, as the anchorages that did exist were small. Leaving Demopolis, we were just 250 miles north of Mobile Bay where we would cross our wake. Our Loop was nearing completion!!! We had completed the Tenn-Tom Waterway and were starting down the Tombigbee River, which was widened by the Black Warrior River just before Demopolis. 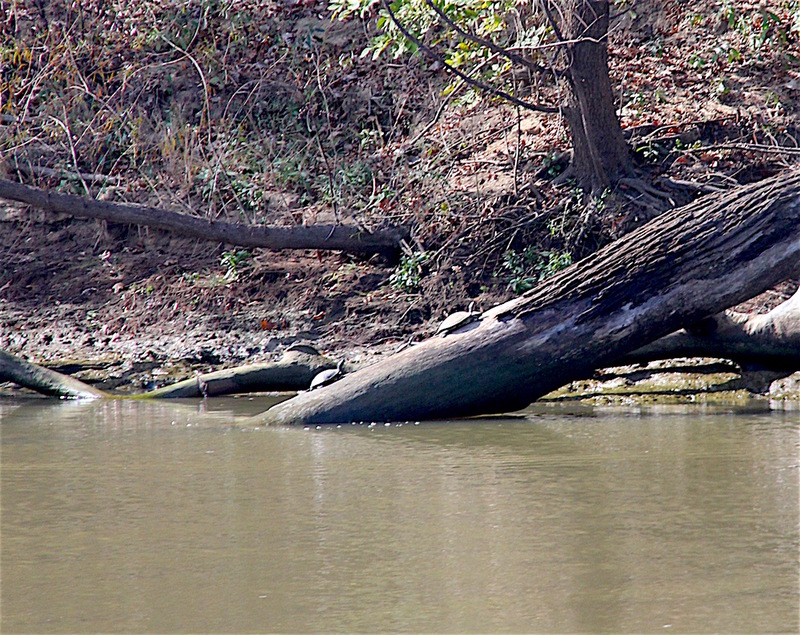 The Tombigbee River would lead us south until it was joined by the Alabama River, at which point it became the Mobile River, which flowed into Mobile Bay. The good news was that all we needed to do was follow the navigation markers and make sure were going downstream. For that, we used the time-tested method Tom used on the Colorado River for many years – throw a stick in the river and follow it. 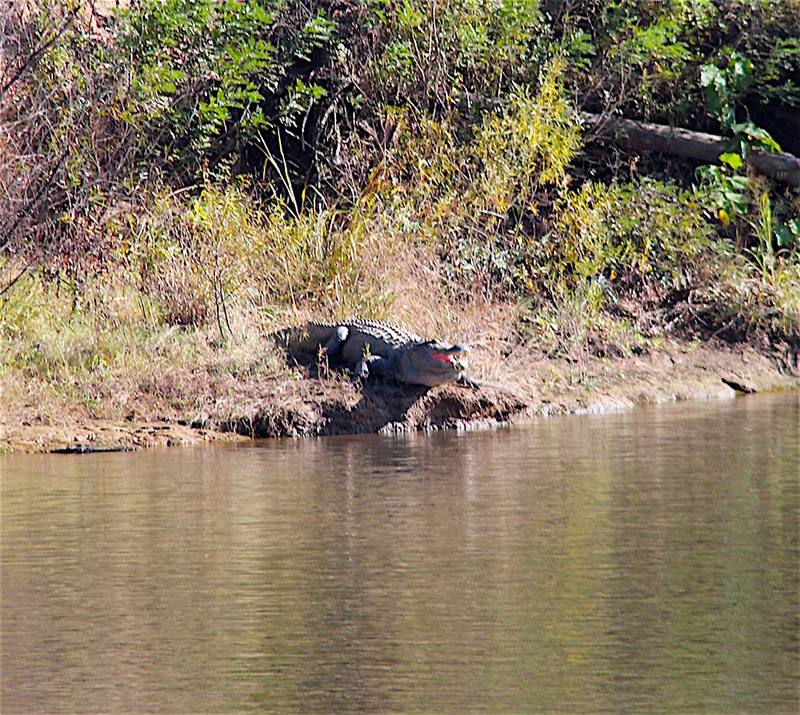 It was a prolific wildlife day – 2 eagles, lots of blue herons, logs full of turtles, and our first alligators (big ones) since the southeast coast. Alongshore, there were sandy banks and large sandy beach areas and trees with Spanish moss. Though much of the river had been canalized (sometimes called “channelized”), there were still many oxbows (bends) that were not. Once, we traveled 7 miles (1 hour) to end up 1/2 mile away if we had traveled a direct line! 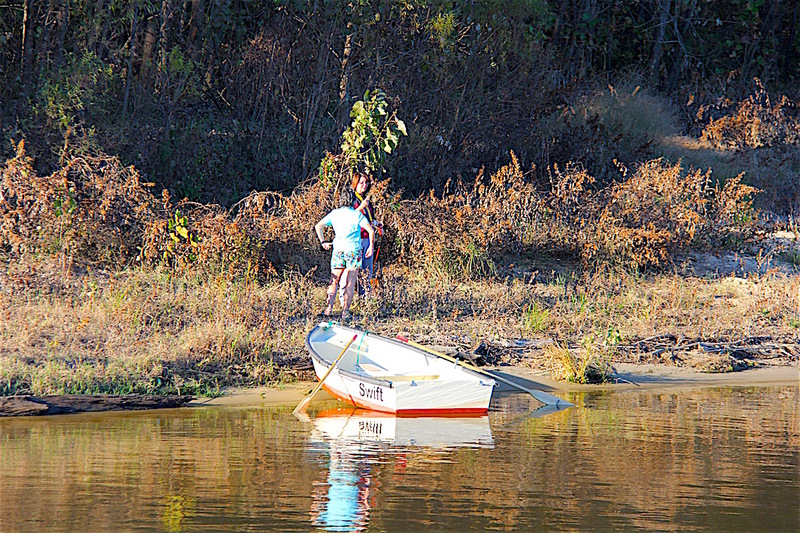 By our anchorage at MM (mile marker) 147, we had spread out, but 3 of us – Tango Papa, Genesis and us, – decided to raft together for the night at Pickens Landing, a wide spot in the river. Everyone visited on our aft deck and then we had dinner together on our boat. Unfortunately, Genesis had had mechanical trouble during the day and decided it was best for them to return to Demopolis the following day. It was quite sad, as “Genesis Tom” had some medical issues and they saw this as the likely end to their last big boat trip. 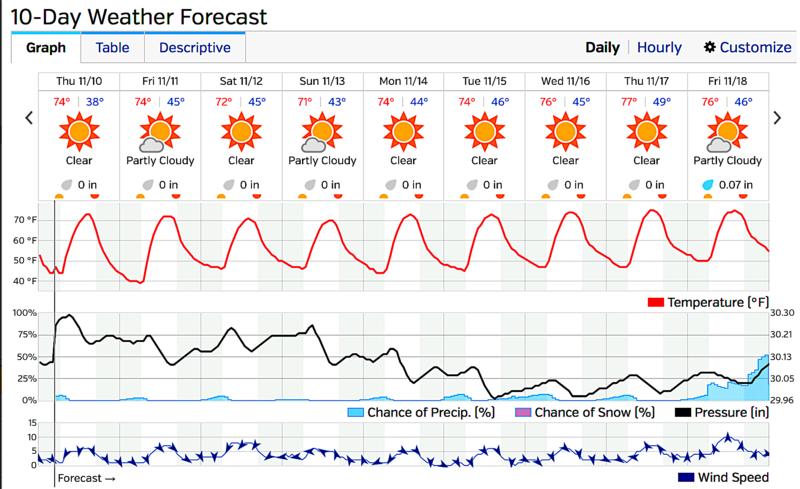 We’re praying for a miracle. After they called it a night, we taught the other Tom and Paula Qwirkle. That made 8 people we’d gotten hooked on the game, we thought. Morning fog delayed Genesis’ depart a bit the next day, but we were all underway at 8:00, sad to say goodbye. We got through Coffeeville Lock with no wait, along with Tango Papa and one of the other boats with which we left Demopolis. Coffeeville was the last lock of our Great Loop! We started counting each milestone that brought us closer to finishing. We had been through over 115 locks and Tom happily deflated the Walmart exercise balls wrapped in fishnet we had used as bumpers for the locks. We were once again back in tidal water and headed for the Gulf. 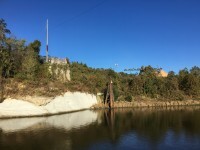 On the way south, we passed the location where a barge was washed under a bridge (no longer there) during flooding in 1979. The barge was tipped on its side, washed under the bridge, then righted itself. One of the engines never quit and no one was hurt!! We rafted with Tango Papa the second night behind a sand bar at Leroy 1 (crazy name for an anchorage, Paula thought), another wide spot in the river and shortly after, enjoyed apps of sparkling cider and spinach dip on our aft deck. Tom V. helped the Tom H. with an oil leak and the strainers on his boat before a combined dinner and another evening game of Qwirkle. 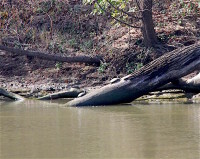 Day 3 below Demopolis was another big wildlife day. Tom counted more than 100 sunning turtles in less than 10 minutes and we also saw 1 bald eagle, 1 gator, and 2 deer (the first in a long time). There were relatively boring tree-lined banks but also the occasional big sand beach. 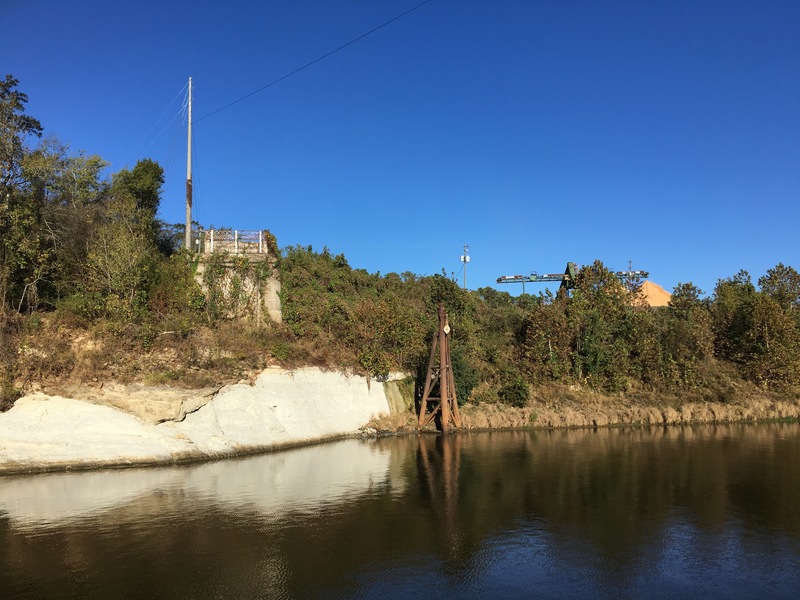 While passing under the Jackson Railroad lift bridge at MM 90, we heard a radio call, “Trawler passing under the bridge, this is Satisfied Frog. Where are you going tonight?” Paula had them shift to a different frequency for personal communication and said, “Satisfied Frog, welcome back to the river.” “Is this Paula?? 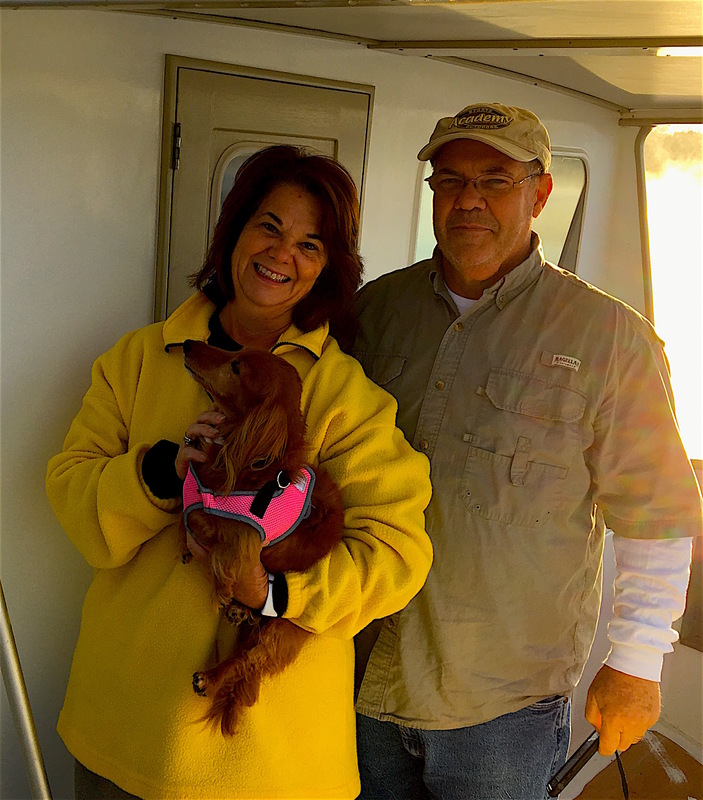 ?” Berrlin and Debra, who we had met their first day of their Loop in Clarksville, TN, had caught back up with us. It was such fun to hopscotch along the Loop and reunite with friends. That evening, we rafted 1/2-mile up the Tensas River with Tom and Paula. We had apps on the aft deck, watched another amazing sunset, followed by supper and Qwirkle, and finished with homemade berry ice cream from Life’s TraVails on-board ice cream maker. Overnight, Paula was dreaming of gold and hatched an idea. 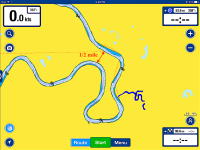 At Eastern Shore Marina, we would be only 17 miles from crossing our wake. But we had boat work to do before we could do that and continue on to FL. (That sort of put an anti-climactic sting to it.) Having made some wonderful friends the past 6 weeks, many had asked what date we would be crossing our wake as they wanted to celebrate with us. But the whole work thing was delaying that and making it an unknown. What if the day after arriving in Mobile, we took the boat out for the day until getting to the path of the Intracoastal Waterway, crossed our wake, then turned around and returned to the marina? Then it would be official!!! Paula quickly texted 9 couples to see who could join us for the outing, not even sure of exactly where everyone was. Before retiring for the night, 2 couples were in and we had the beginning of a party! We had changed our minds several times about where to go in Mobile. We wanted to haul the boat out of the water, have the props checked, see if we needed to repaint the bottom, and do a few other maintenance items before crossing the Gulf in FL. 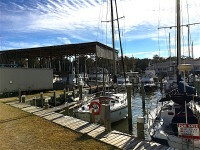 Tom called Dog River Marina (not a great neighborhood), Eastern Shore Marina in Fairhope (thought the lift wasn’t big enough for us, which turned out to be incorrect), Nelson Boatworks (couldn’t stay on the boat while it was on the hard), and Turner Marine (more for sailboats). 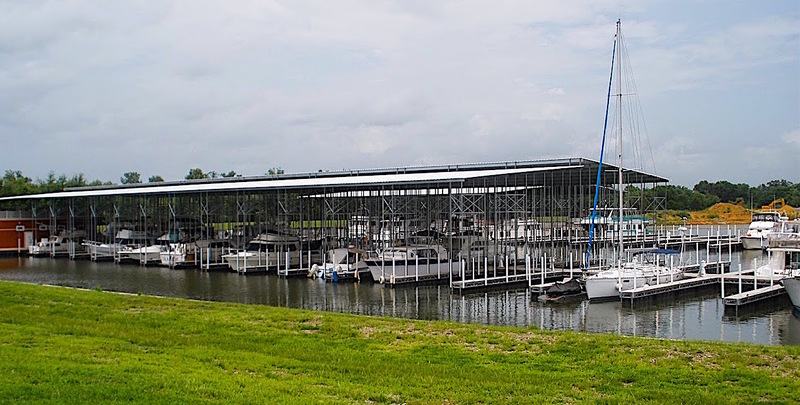 We finally decided to go to Eastern Shore Marina, at least for a few days, as Tom needed to leave for 2 days for a meeting in TX and other boaters thought the neighborhood around Eastern Shore was a nicer place for Paula. In the morning, we pulled anchor at 6:15 from MM 39 for our final leg to Mobile Bay, MM 0. At MM 6, Mobile’s tall skyline came into view. Paula got on the radio and told the other Tom & Paula, “We aren’t in Kansas anymore!” Indeed we weren’t. 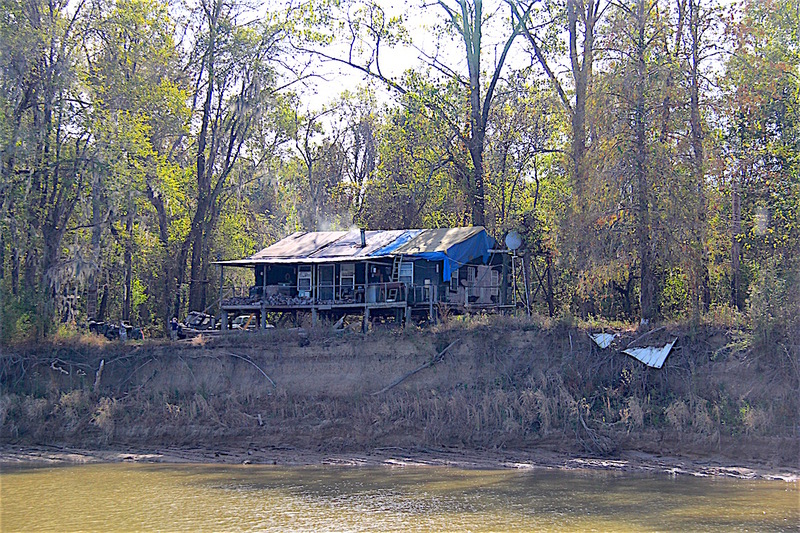 Gone were our rustic scenes and quietness along the Tombigbee. The Mobile River delta, an area up to 25 miles wide and 40 miles long, sprawled ahead. It was the widest-open water we had seen since Lake Michigan, 1,250 miles river miles behind us. The harbor was a busy place, the largest port of entry along the southern coast. Each year more than 40 million tons moved through the port, 12th busiest port in US. At MM 3, we passed a fleeting area where barges up to 4 deep for over a mile moved around loading, unloading, making up or breaking down 6-8 barge tows. Soon we were through Mobile…our last city before finishing our Great Loop, and out into the north end of the bay, making the final 7 miles of the day to Eastern Shore Marina. We picked up Satisfied Frog along the way in the bay and the 3 of us filed in. Close behind was Jaycie Lynn, who having gotten Paula’s text, was making their way over to join us. It was a very tight, small marina and there were few spaces left after the 4 of us arrived. After catching everyone’s lines, we walked around and found more boating friends and ended up with 14 for dinner at Sunset Point across from the marina. 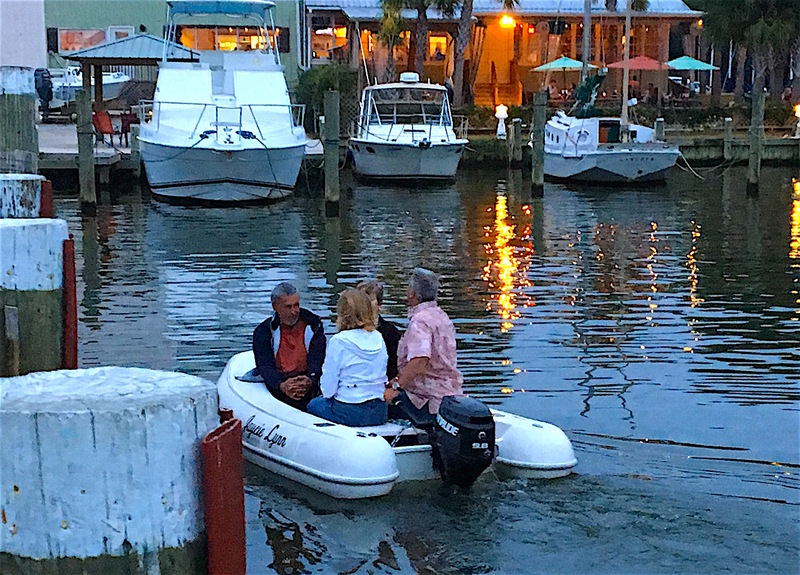 Scott ferried us over to the restaurant in his dingy. Around the table were Tango Papa’s Tom and Paula, Jaycie Lynn’s Scott and Mary Haws, The Journeys’ Jim and Cindy Kosmos (who we hadn’t seen since Lake Michigan), Satisfied Frog’s Berlin and Debra Collins, Tosca II’s Rowland and Alex Harrison, and Glorious Dei’s Thad and Cindy Harvey. It was so much fun and we considered it a celebration of our next day’s finish. New experiences… new friends… a life defining journey. Great to hear you enjoying it, looking towards the finish. We want to do it again! 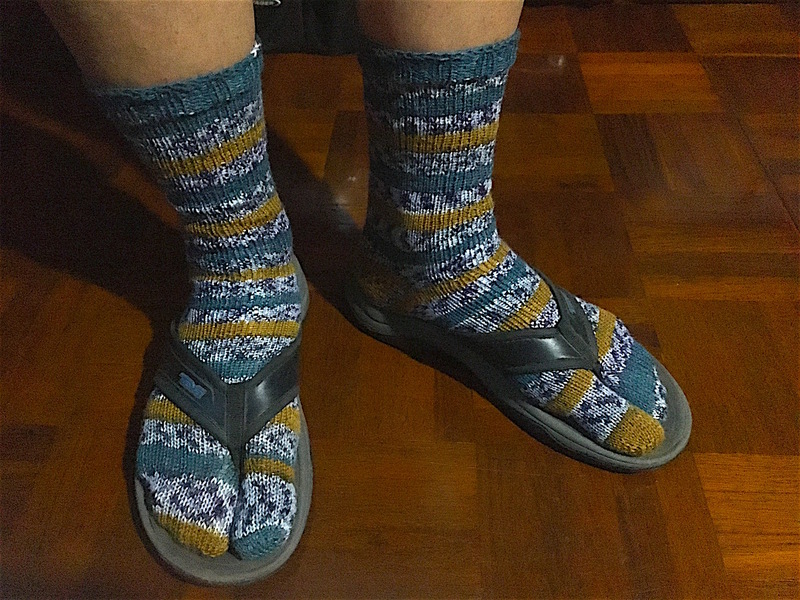 Hi Paula and Tom, Good to read your blog. We almost caught up with you again, we crossed the Tombigbee on I-20 on 11/26 at 17:30. That is the very long day of our three day drive, the Abilene to Atlanta leg. We are back in Ocean View, DE. till Christmas Eve. Nice drive, kind of sad without our dog. Did I see you are taking the boat to Florida? Bob, wow, so close again. Wouldn’t it have been amazing to look down over a bridge and recognize our boat? I know it must be sad without your special 4-footed friend and different situations are a reminder she is not there. Nave wonderful Christmas in DE. We are continuing on to FL. We didn’t get to do the Keys last time.